Present state: A housing development, Troy Gardens, now occupies part of the site of the goods yard. The site of the passenger station is (2013) is currently undeveloped and the platforms can still be seen as can the bricked up portals of Monmouth Troy tunnel. Notes: Monmouth Troy was built for the Coleford, Monmouth, Usk and Pontypool Railway and opened on 12 October 1857. 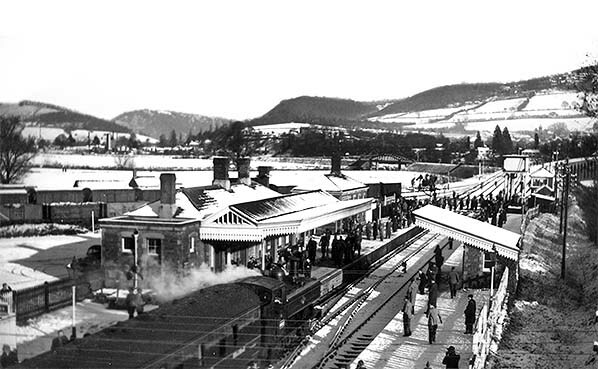 It was the largest of the two stations in Monmouth, the other station being Monmouth Mayhill (or May Hill). The Ross & Monmouth Railway arrived at Monmouth Troy in 1874 followed shortly by the Wye Valley Railway in 1876, the Coleford Railway came later in 1883. The station was opened as Monmouth Troy House but shown in timetables as Monmouth Troy from 1904. The Coleford Railway closed in 1917; The Coleford, Monmouth, Usk and Pontypool Railway withdrew passenger services in 1955, followed by freight services on 12 October 1957. The Wye Valley Railway and Ross and Monmouth Railway struggled on until 1959 when both railways were served with a closure notice followed by the withdrawal of passenger services. The covered footbridge was removed before closure to passengers. 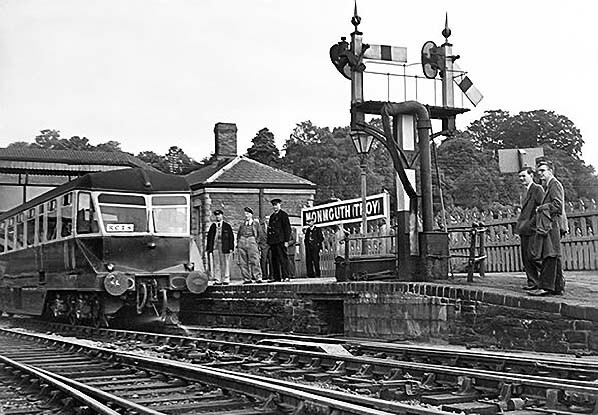 Freight Services on both lines to Monmouth Troy continued until January 1964. Monmouth Troy station officially closed to all services on 5 January 1964. If Monmouth had remained a county town it would have been the first county town in Britain to lose all its railway services. Monmouth Troy had a large goods yard to the north of the station; this was constructed at the same time of the station. It had six sidings one passing through a large goods shed. The northernmost siding served a cattle dock and pens. There was a 10-ton capacity crane. The short tunnel directly to the west of the station that took the railway beneath Gibraltar Hill was called Monmouth Troy tunnel. It was 140 yards long. After laying derelict for many years the station building was bought by the Gloucestershire Warwickshire Railway. It was demolished brick by brick and has been reassembled at Winchcombe station. The work which started in 1987 was completed in 1999. The line was constructed opened 1856 and 1857 with the principal aim of carrying iron ore from the Forest of Dean to furnaces near Nantyglo. It was authorised under an Act of Parliament of 20 August 1853, to operate from a junction with the Newport, Abergavenny & Hereford Railway, near Pontypool, to Coleford, Gloucestershire, with a branch to serve the gas works at Monmouth. Diverging at Little Mill Junction, two miles north west of Pontypool Road station, the line ran to Monmouth Troy station. The Monmouth Viaduct was built over the River Wye in an attempt to reach Coleford in the Forest of Dean, but following the purchase of the line by the GWR the scheme was abandoned. The link to Coleford was later completed by the GWR and opened as the Coleford Railway in 1883. The four miles from Little Mill Junction to Usk were opened on 2 June 1856, and the 12 miles onwards to Monmouth Troy opened on 12 October 1857. At first the company worked its line with engines hired from the Newport, Abergavenny and Hereford Railway, before coming under the control of the GWR. From 1940 ROF (Royal Ordnance Factory) Glascoed which produced munitions for the armed services was served by the line with a branch and two small halts. When the line officially closed the factory continued to be served by rail along the eastern section of the line until 1993. The overgrown track from Little Mill Junction to what is now BAE Systems factory remains in situ but is completely impassable. The line was closed on 30 May 1955 due to a train drivers strike and was never reopened. Its closure was originally planned for June 1955, but because of the strike the last service was run 28 May when the national strike began. A Stephenson Locomotive Society special ran along the line exactly 100 years from opening on 12 October 1957. The Railway had stations at Little Mill Junction, Usk, Llandenny, Raglan, Dingestow and Monmouth Troy. Halts were added at Glascoed (1927), Elms Bridge, (1933) and Cefntilla (1953). 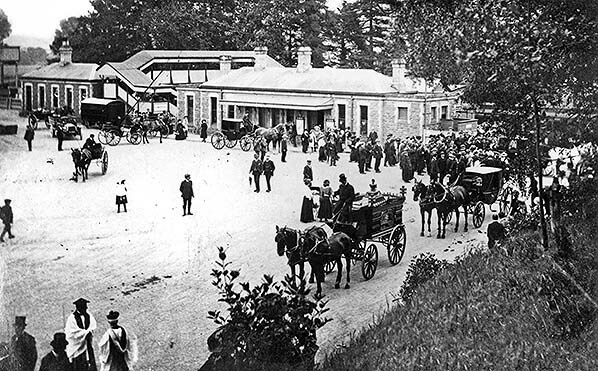 Raglan Station, known as Raglan Road, was closed in 1931 and was moved to a previously unofficial stopping place called Raglan Footpath. 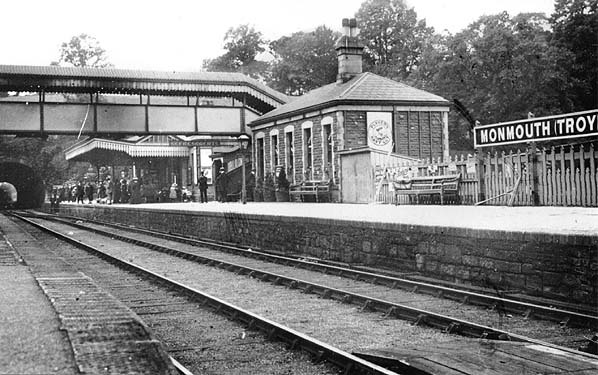 The original station was then re-opened as a halt on 24 July 1931. The Wye Valley Railway ran for nearly 15 miles between Chepstow and Monmouth along the lower part of the scenic Wye Valley. It followed the route of the River Wye for most of its length. The line opened on 1 November 1876 as an independent company but was financially unsuccessful and amalgamated with the Great Western Railway in 1905. The GWR ran the line until the Transport Act 1947, which nationalised the railways of Britain. From then, it was operated by British Rail until its closure to goods traffic in 1964; passenger traffic was withdrawn before that date on 5 January 1959. The southern section of the railway between Tintern Quarry and Wye Valley Junction remained open until 1981, when operation was then cut back to Dayhouse Quarry, (near Tidenham Station). This remained used for quarry traffic until the early 1990s. The line was inaugurated by an Act of Parliament in 1866, although construction was delayed until 1874 because of national economic circumstances. These events were caused by the collapse of the well known firm Overend and Gurney in 1866 due to many railway companies taking out loans and not paying them back. The business was in a debt of 11 million pounds when it collapsed. The southern part of the line, between Chepstow and Tintern, was particularly complex in engineering terms, requiring a long tunnel of 1188 yards at Tidenham, a stretch along a steep hillside above the River Wye, and a second short tunnel and bridge at Tintern. Evangelical services were organised during the construction of the line at Woodcroft and Tidenham, partly in an attempt to combat drunkenness among the labourers building the railway. North of Tintern the line followed the valley bottom, with a bridge over the river at Penallt. Outside Monmouth, the line used an existing viaduct across the river which had been built in 1861 by engineer Joseph Firbank to carry the Coleford, Monmouth, Usk and Pontypool Railway. On 18 November 1875, during the construction of the line, a landslide occurred near Redbrook. The railway was opened on 1 November 1876, from Wye Valley Junction near Chepstow, on the main line between Gloucester and Newport, to Monmouth Troy. Here passengers could change for Pontypool (along the Coleford, Monmouth, Usk and Pontypool Railway), Ross-on-Wye (along the Ross and Monmouth Railway) and Coleford (along the Coleford Railway). Trains stopped at the intervening stations on the line, Tidenham, Tintern, Bigsweir (later renamed St Briavels), and Redbrook. The line was intended to serve both tourist traffic and freight, such as those visiting Tintern Abbey, and also the limestone quarries, paper mills and metal works in the Wye Valley. Although constructed by the Wye Valley Railway Company, the line was operated from the outset by the Great Western Railway. It was not financially successful, and in 1905 the Wye Valley Railway Company was bought by the GWR. The Wye Valley Railway had been bankrupt more than once during its short life as an independent company and GWR's purchase of the line may well have been inevitable. The GWR added several halts along the line, at Netherhope Halt (1932), Brockweir Halt (1929), Llandogo (1927), Whitebrook Halt (1927), Penallt Halt (1931), and Wyesham (1931). Penallt Halt and Redbrook Station became the closest stations on the line with only a viaduct over the River Wye separating them. Tutshill Halt for Beachley was also added in 1934 on the mainline at Wye Valley Junction and served by WVR trains. In the inter-war period, there were about five trains in each direction each day, and popular excursion trains were also run to Tintern, particularly to see the harvest moon through the abbey windows. Redbrook Station became nationally noted for its floral displays. However, after a long decline in revenue associated with the growth of motor traffic, the line closed to passengers in 1959. The last ever passenger train was a special service run by the Stephenson Locomotive Society. It was hauled by two GWR Pannier Tanks, class 6400. They were numbers 6439 and 6412 (see pictures below). The train ran all the way along the branch from Chepstow to Monmouth, from there it ran along the Ross and Monmouth Railway (which was also closed at the same time), to Ross-on-Wye. The special service was the only known train to make the route in one single journey. 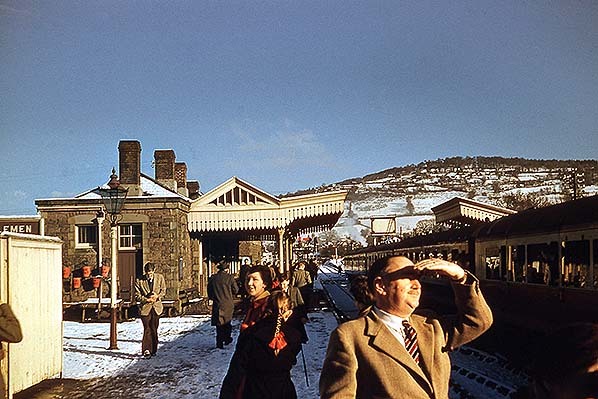 The railway closed to general goods traffic between Monmouth and Tintern Quarry on 6 January 1964. Several railtours ran by enthusiasts were held through Tidenham tunnel in the 1970s, one of the last of these in 1978, the Tintern Totter was hauled by a Class 20: D8098. The engine has survived into preservation and is owned by the Type One Locomotive Company. The section to Tintern Quarry closed in 1981, there were three special services to the site of Tidenham Station in the 1980s, then the rest of the line was abandoned when Tidenham Quarry closed in the 1990s. The branch started at Chepstow on the west side of the River Wye. It followed the route of the South Wales Railway (now Gloucester to Newport Line) over the River Wye on the Chepstow Railway Bridge to Tutshill Halt (a small request stop serving the village of Tutshill). The WVR left the main line at the Wye Valley Junction and headed up on an embankment to Tidenham, the first station on the line. It was also the first station on the line to be closed, temporarily to release staff during World War I; it was then re-opened in 1918. Tidenham station remained open until the closure of the line to passenger services in 1959, by which time it had been demoted to a halt. Just outside the south portal of Tidenham tunnel was Netherhope Halt; this was the last halt to be constructed on the line before it was closed to passenger services in 1959. The line then headed into Tidenham tunnel (1190 yards). The line ran along the east side of the Wye, passing Tintern Quarry. It then went through the smaller Tintern tunnel, (182 yards) and crossed back to the west bank of the River Wye before coming to Tintern station. Tintern was the largest station on the line. This was because the Wye Valley Railway Company hoped to generate much income via the tourists visiting the famous Tintern Abbey. The line then came to Brockweir Halt, followed by Llandogo Halt which was the smallest stop on the railway. The line followed the course of the west bank of the River Wye to St Briavels station which was named Bigsweir station on opening and renamed St Briavels & Llandogo in 1909 and then simply St Briavels from 1927 in anticipation of the opening of Llandogo Halt. Journeying along the line the train would next come to Whitebrook Halt and then Penallt Halt. Penallt Viaduct carried the railway over the River Wye again and onto the east side of the river before reaching Redbrook on Wye station. This station won numerous prizes for its flower displays and became renowned throughout the valley. Wyesham Halt was the last stop before Monmouth Troy. The section between Wyesham and Monmouth involved crossing the Wye one last time by a large viaduct that was built by the Coleford, Monmouth, Usk and Pontypool Railway in 1857 as part of their plans to expand into the Forest of Dean and to Coleford. Monmouth Troy station was also constructed by the Coleford, Monmouth, Usk and Pontypool Railway. All of the original stations on the line, Tidenham, Tintern, St Briavels and Redbrook had a loop for trains to pass each other. Tintern, St Briavels and Redbrook stations were the only stations apart from Monmouth Troy and Chepstow to have goods facilities. The Coleford, Monmouth, Usk & Pontypool Railway was the first company to plan a standard-gauge railway between Coleford and Monmouth, intending to construct the railway mainly over the route of the Monmouth Tramroad. However, the CMU&PR became bankrupt after the construction of the line between Monmouth and Pontypool. Although they had built a large viaduct across the River Wye in an attempt to reach Coleford, plans to extend the line to Coleford were abandoned when the Great Western Railway purchased the line. It was later in 1883 that the Coleford Railway Co. finished construction of the branch line to Coleford. The line became the fourth and final branch line to reach Monmouth Troy Station when it was opened on 1 September 1883. The railway followed the route of the Monmouth Tramroad for nearly all of its route, only making occasional deviations to straighten out sharp curves. The railway included four tunnels over its 5-mile route. There was only one stop between Wyesham Junction (where the line met the Wye Valley Railway and continued on to Monmouth Troy Station) and Coleford; this was Newland . The Coleford Branch never fulfilled the hopes expected of it and it closed between Wyesham Junction and Whitecliff Quarry on New Year's Day 1917. There were several suggestions of opening the whole branch up under the control of the nearby Severn & Wye Railway; the railway which took over the stretch to Whitecliff Quarry. However, the line was never fully re-opened because of the cost of maintenance. 1921 1:2,500 OS map shows the layout of the station and goods yard. The main station building is on the up platform with a waiting room on the down side.The platforms are spanned by a covered footbridge. An extensive goods yard with five sidings is sited to the north of the station. Access to this is controlled by a signal box beyond the east end of the down platform. Immediately west of the station the line runs into Monmouth Troy tunnel. 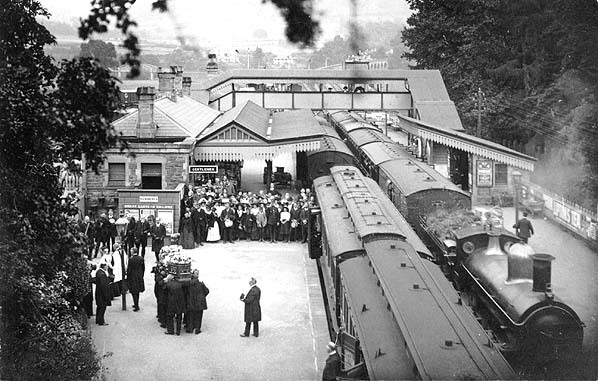 The large forecourt at Monmouth Troy station in July 1910 prior to the funeral of Charles Rolls. The funeral cortege travelled from the station to St. Cadoc's church at Llangattock-Vibon-Avel, five miles west of Monmouth. Monmouth Troy station looking south-west towards Monmouth Troy tunnel. This pictures is undated but the people on the platform are in Edwardian dress so that and the ash-ballasted track suggests pre-WW1. Note the advert for Players Navy Cut on the end of the building. The Railway Correspondence & Travel Society 'Wye Valley and Brecon & Merthyr' railtour of 22 June 1952 stands at Monmouth Troy. The tour started at Bristol Temple Meads and the route was Yate, Lydney, Chepstow, Monmouth, Ross-on-Wye, Hereford, Brecon, Merthyr, Quakers Yard, Pontypool Road, Severn Tunnel Junction. It is not clear if the tour then returned direct to Bristol or if it returned via the same route. The tour used ex-GWR diesel railcar No.W24W throughout and which is seen here with a simple but to-the-point RCTS board in its windscreen. This tour must have been very pleasant; a relatively small group in the cosy interior of the railcar. Railcar W24W was from the later Swindon batch built 1940/1 which had more angular and quite attractive bodies in comparison to the earlier streamlined series although attractiveness is, of course, a matter of opinion. Mechanical parts were supplied by AEC and each car had two AEC 130hp engines. The ex-GWR railcars finally bowed out in October 1962 and W24W was among the final survivors but did not receive BR green livery, retaining crimson and cream livery as seen in this view until the end. She did not survive into preservation but sisters W20W and W22W did, along with 'Flying Banana' W4W. Monmouth Troy in November 1958. On the left on the down platform is 0-4-2T No. 1455 pushing an auto-train from Ross-on-Wye. On the right is 0-6-0PT No. 6439 on a train to Severn Tunnel Junction. Note the footbridge seen in the picture above has gone. On 4 January 1959 the Stephenson Locomotive Society special to mark closure to passengers is seen at Monmouth Troy. The train has arrived from Ross-on-Wye and is reversing before returning to Chepstow, following which it visited Sudbrook Pumping Station before running to Severn Tunnel Junction where it terminated. The locomotive is 0-6-0PT No.6412 and No.6439 was on the other end of the train. The train was an 8-car set comprising BR Mk1s and ex-GWR stock. Two headboards were present, one bearing 'SLS Special' and the other 'Last Train Monmouth - Ross 4th January 1959'. Neither are present in this view. Both locomotives were members of the Collett 64xx class; No.6412 lasted until November 1964 while No.6439 bowed out in May 1960. Of these two, No.6412 has survived into preservation being sold straight out of BR service to what is now the South Devon Railway. On 4 January 1959 the Stephenson Locomotive Society special to mark closure to passengers is seen at Monmouth Troy. The train has arrived from Chepstow and is reversing before taking the line to May Hill and Ross-on-Wye, seen branching off to the left in the background. The locomotive is 0-6-0PT No.6439 and No.6412 was on the other end of the train. The train was an 8-car set comprising BR Mk1s and ex-GWR stock. 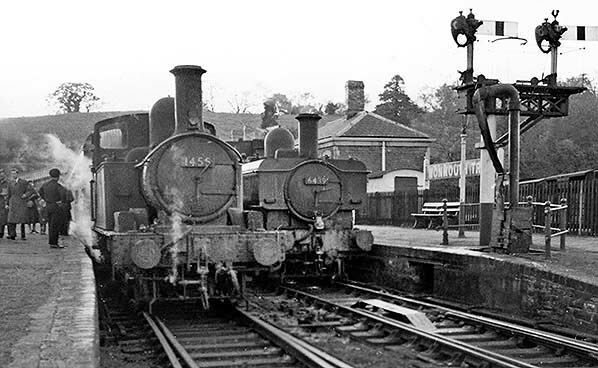 Two headboards were present, one bearing 'SLS Special' and the other 'Last Train Monmouth - Ross 4th January 1959'. 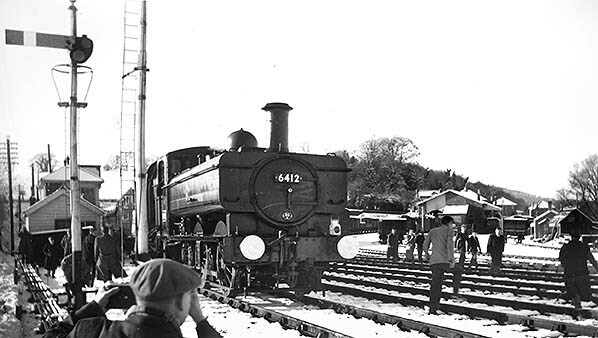 A set of four more photographs of the Stephenson Locomotive Society special to mark closure to passengers is seen at Monmouth Troy on 4 January 1959. 0-6-0PT No.6412 is seen at the east end of the train. 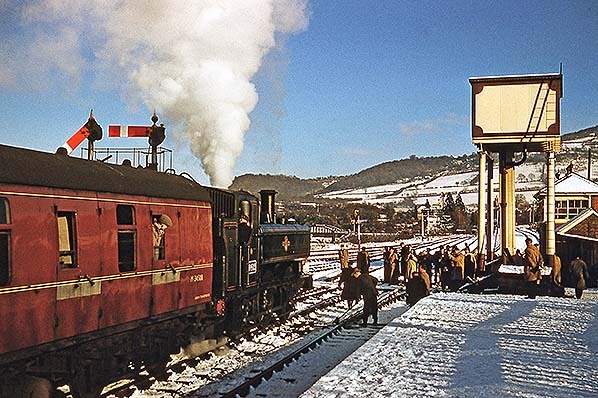 Looking south-west along the up platform at Monmouth Troy station on 4 January 1959; the Stephenson Locomotive Society special is seen in the down platform.